The 4th Australian Light Horse Regiment in cavalry formation moving up to the attack on the enemy's position at Kaukab. 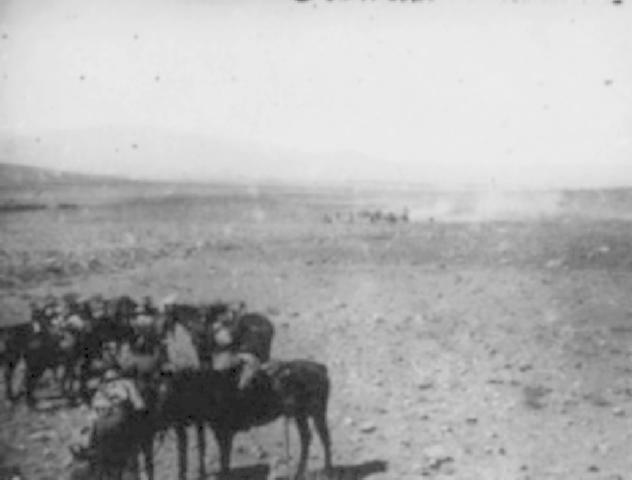 Kaukab, an action fought on 30 September 1918 about sixteen kilometres south-west of Damascus, brought about when a Turkish column attempted to block the advance by leading elements of the Australian Mounted Division (Major-General Henry Hodgson) towards the city. 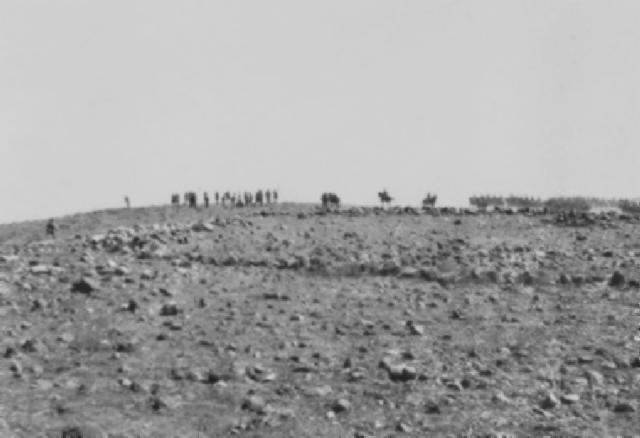 The Turks, numbering several thousand, were themselves falling back north-east on Damascus, but when they sighted the 4th Australian Light Horse Brigade (Colonel Murray Bourchier) they moved across its path and took up position along a ridge with the clear intention of making a stand. Hodgson ordered Bourchier's 4th and 12th regiments to prepare to charge with the sword across the two kilometre wide stony valley separating the two forces, while the 5th Light Horse Brigade (Brig. General George Macarthur-Onslow) - ignoring the enemy's line-pushed past the western flank and kept going. 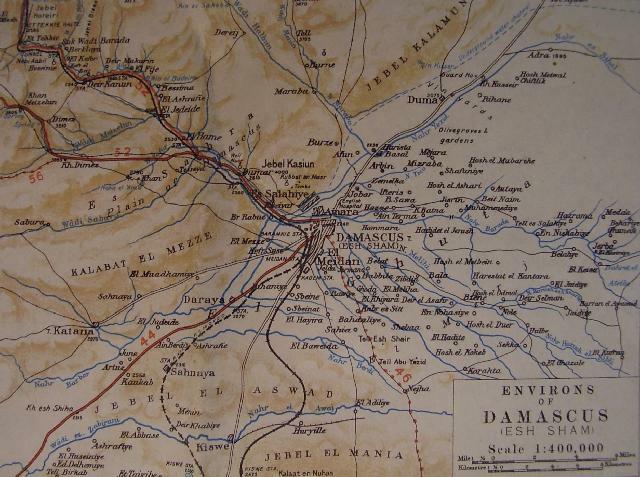 Map of the Damascus region with Kaukab located at the bottom left (south west) side of Damascus. Although their position was well covered by many machine-guns, the Turks had no guns with which to reply to the fire opened up on them by the British horse artillery in Hodgson's force. As the latter began bombarding the Turkish machine-gun posts over open sights, and with Macarthur-Onslow's brigade (French cavalry on distinctive grey horses being prominent) moving ominously in their rear, the Turks lost all heart for a fight. The Australians were expecting a hot reception by the time Bourchier finally gave the order to advance soon after 11 a.m., but in the event the action was bloodless. The German machine gunners abandoned their weapons without firing a shot at the charging lines of horsemen and joined in the general flight. Twelve machine-guns were thus captured, and 22 prisoners, for no loss to the attackers. A battery of the Nottinghamshire Brigade (The Notts) in action at Kaukab. Extracted from the book produced by Chris Coulthard-Clark, Where Australians Fought - The Encyclopaedia of Australia's Battles, Allen and Unwin, Sydney, 1998, pp. 164.